With over 120,000 personnel across the globe, the United Nations is helping countries torn by war to attain peace and security after violent conflicts. In these efforts, the mobilization of youth has been a crucial component in ensuring that national rehabilitation, community engagement, and economic advancement can be achieved in the aftermath of war’s profound destabilization and destruction. 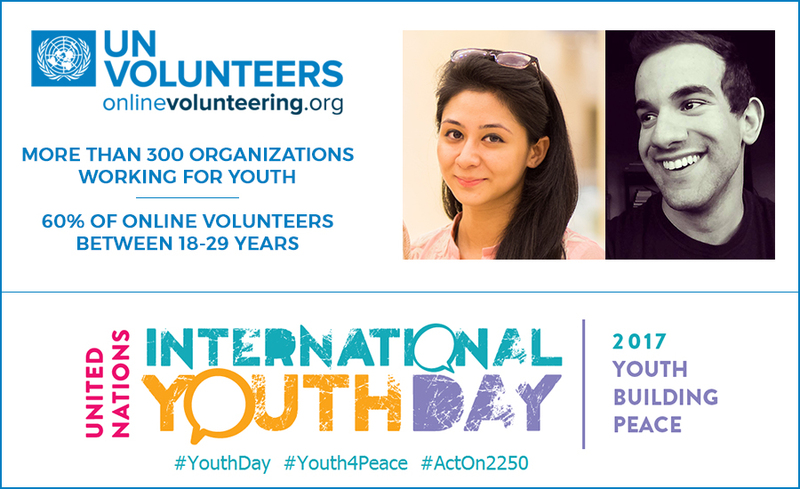 In the above picture, UN online volunteers César Augusto Ortelan Perri (Brazil) and Zara Qaiser (Pakistan). Despite being one of the most vulnerable population groups in times of conflict, young people’s boundless energy can be channeled into meeting the demands posed by complex antagonisms and help their societies thrive and overcome the burdens of bloodshed and poverty. Advocating for global solidarity and multilateral cooperation, as well as promoting the creed that no one should be left behind, UNV and its extensive network of Online Volunteers actively engages young people in various development initiatives. One of these is the online support for UN peacekeeping missions in war-scarred societies, in an attempt to preserve post-conflict stability. Through the UNV’s Online Volunteering service, young university graduate César Augusto Ortelan Perri (Brazil) engaged as a graphic designer with the United Nations Organization Stabilization Mission in the Democratic Republic of the Congo (MONUSCO), where he conceptualized and designed professional layouts for the organization’s annual reports and fact sheets. He contributed to the peacekeeping mandate as an online volunteer by creating interactive graphics and visualizations for various newsletter formats, thus increasing the outreach of the mission’s communications. I started my online volunteering activities in September 2015. Living in a multicultural environment during my scholarship in Italy allowed me to learn a lot of things and to notice how we all are interested in making the world a better place. Back to Brazil, I wanted to keep this feeling alive and then I discovered the UNV Online Volunteering platform. Through this platform, I could put my two passions together: using design for good to make a difference in the world. We have the opportunity now to make a difference, using the power of information technologies for good causes. Through its Online Volunteering service, UNV mobilizes more than 12,000 online volunteers every year to undertake over 20,000 online volunteering assignments worldwide. 60% of this remarkable force consists of young people between 18-29 years old, and over 300 youth organizations are registered with the service. In 2016 alone, 180 online volunteering opportunities with a focus on the empowerment of youth were posted, and more than 1,000 online volunteers were mobilized to support these initiatives. Among the primary motives for youth to engage in online voluntary activities are the skill-development aspect and the exposure to SDG-related programmes, policies, and networks. Online Volunteering can be a milestone in a young professional’s career, fostering personal growth and increasing the role a young person plays as an active agent of change. On 5 December, International Volunteer Day, UNV honors the exceptional contributions of its online volunteers and shares their success stories with the world to set a positive example. With nearly 1.3 billion aged between 15-24 years in the world and around one billion living in developing countries, where conflict is more likely to take place, the youth holds vast potential in terms of bringing positive change that advocates peace-building. (…) Through exchange opportunities, youth can gain the skills necessary for compassionate response, heart-centered communication, conflict resolution and peace-focused leadership. Since its launch in the year 2000, the Online Volunteering service has connected over 3,000 organizations with the right volunteers, who are highly-skilled and talented individuals from diverse cultural environments, professional backgrounds and age groups. With an access to UNV’s global talent pool of over half a million people, it is possible for any organization to find the volunteers they need for their peace and development projects.